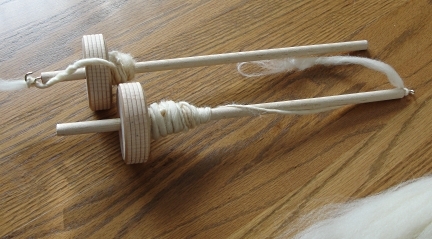 Homegrown Hearts » Blog Archive » Homemade Drop Spindles! After taking a spinning class last weekend, I realized that the spindle I had was really too small and light to use very well. I shopped around for a new one and there are a lot of expensive spindles out there! I did find one that I could buy shipped for $7.50. I probably would have gone with that, except I then found directions for making my own. That’s right up my alley, so I decided that if it wasn’t too much of an investment, I’d give it a shot. I made 2 spindles for under 8 dollars, so it wound up being the cheapest option and they do work! My old spindle is there for size comparison. Measure, mark, and cut dowel to desired length. My original spindle was only 6″. I made my new one 12″, which seems to be a pretty standard size. Slip a wheel over the dowel. Leave 2-3 inches of dowel below the wheel for a bottom whorl or 1-2 inches for a top whorl. The wheel will fit fairly tightly, but as a precaution you will probably want to run some wood glue around the joint where the wheel and dowel meet. Insert the cup hook in the center of the top of the dowel. For a top whorl this will be at the end closest to the wheel. For a bottom whorl it will be the end farthest away from the wheel. That’s all there is to it! You can sand the dowel if it is rough at all, you don’t want it catching on your yarn. You can also stain the spindle if you like. I made one of each type of spindle. I may need to adjust the location of the wheel on the dowels until I find where they spin best. If you are going to do this, wait until you find your ‘sweet spot’ before using the wood glue. Which one do you prefer? The top or bottom? I don’t think mine is heavy enough either. I might have to make a new one. 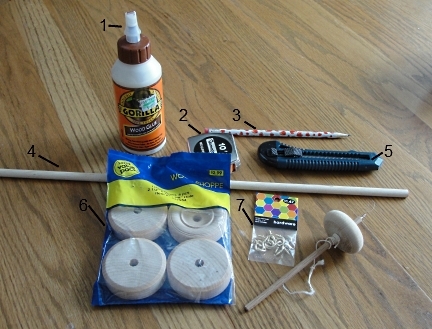 Hmmm…if I get it down pat I could teach the homeschool group how to make these and then teach them how to drop spindle! Something to think on anyway. You can also use old CD’s instead of a wheel. There are instructions for that online, too. You need a rubber gasket thing for that, though. Just picking up a package of wheels seemed easier to me than tracking down parts at Radio Shack or somewhere, but I think it would be even cheaper that way if you wanted to try it. I’m not sure which one I prefer yet. I think the bottom whorl. I guess you’re supposed to use one or the other based on how thick/heavy your yarn is or something. I still haven’t been consistent enough with anything to call my yarn thick or thin – it’s more both. I’m calling it “folksy random” weight at this point. I need a LOT more practice. And a set of carders would be nice, too. I make these regularly for gifts. I like to make notches in the dowel where the wheel sits (they’ll be covered by the wheel when it’s in place) and inside the hole in the wheel. This gives the glue something to grip and the spindle’s less likely to come apart when it’s dropped. And it will be.